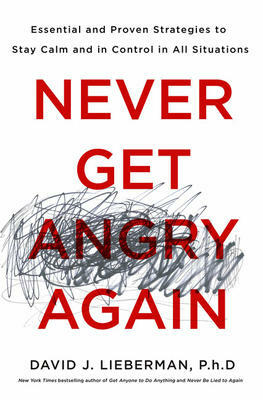 Never Get Angry Again by New York Times and internationally bestselling author David J. Lieberman's comprehensive, holistic look at the underlying emotional, physical, and spiritual causes of anger, and a practical guide to what the reader can do to gain perspective. Take a deep breath and count to ten. Meditate. Visualize your happy place. You’ve probably heard all of these anger management techniques and more from friends, family, and experts, but somehow they miss the mark when it comes to coping with the complex emotion of anger. Let’s face it: if anger-management techniques were effective, you wouldn’t be reading this book. These clumsy attempts to maintain calmness are usually futile and sometimes emotionally draining. The fact is, either something bothers us (causing anxiety, frustration, or anger), or it doesn’t. A state of calm is better accomplished by not becoming agitated in the first place. When we fight the urge to blow up or melt down, we fight against our own nature. David J. Lieberman, Ph.D. is aNew York Times bestselling and award-winning author and internationally recognized leader in the fields of human behavior and interpersonal relationships. His eleven books have been translated into 26 languages and have sold more than 3 million copies. His work has been featured in hundreds of major publications, and he appears as a frequent guest expert on national media outlets, including The Today Show, The View, The O’Reilly Factor, and Fox & Friends.